I’m home from SAFF now with enough fiber to keep me busy for a long time. Which is good! I’ll be posting about my various loot as I use it. One of the things I bought was a “practice” silk lap. What’s that, you say? It’s basically like a giant silk hankie that’s several feet wide and long, and about an inch thick. Last spring I bought a totally gorgeous hand-dyed one, and I’ve been hesitant to try to spin it because it’s so beautiful I don’t want to screw it up. Solution? Buy a cheaper lower-quality one to practice on! So I did. I have asked a number of experienced spinners the best way to tackle this, and each had a different suggestion. The one I liked best is to core-spin it. Essentially, you have a thin core (like a thread) that you wrap the silk fiber around (spinning step), then go back and bind it with another thin thread (plying step). I learned how to do that in my class last spring at John C Campbell Folk School, and it really shows off the fiber. So at SAFF I also bought a very fine wool yarn to use for the core and the binder. So just to feel better, I”m going to spin something easy and lovely now. Until next time. 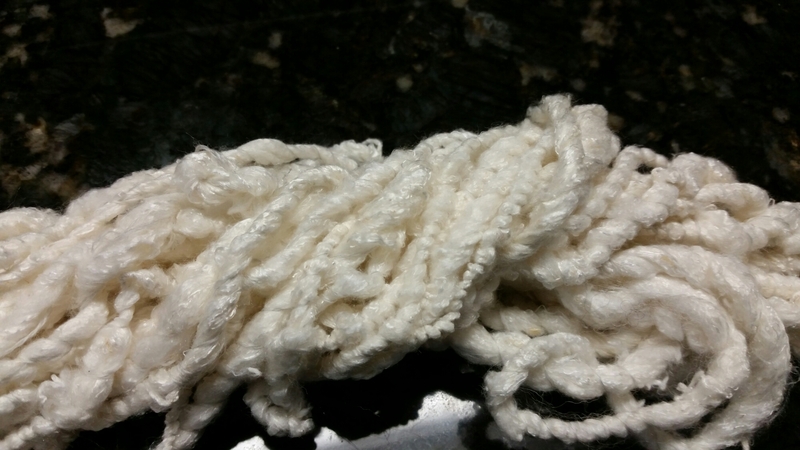 Today’s picture is the core-spun silk from today’s practice. This entry was posted in Art, Fiber. Bookmark the permalink.